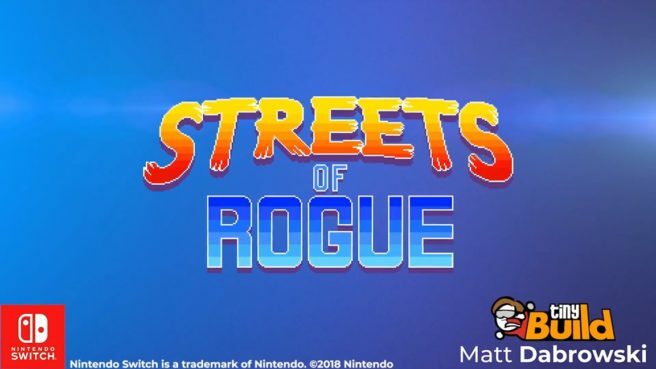 In collaboration with creator Matt Dabrowski, tinyBuild has announced that Streets of Rogue is making its way to Switch. It’s due out on the system later this year. Streets of Rogue, “a rogue-lite about player choice, freedom, and anarchic fun” has been well-received on Steam. Continue on below for some additional information and a trailer. Rather than taking place in a dungeon, the game is set in a functioning, procedurally generated city, where complex AI informs denizens from all walks of life, who are just trying to get by in their daily activities. In order to progress, the player will need to accomplish specific mission goals in any way they see fit through use of their special character traits, items, and the environment. Play the game YOUR way! Don’t want to kill anybody? That’s cool! Want to hack computers? Got ya covered! Super-advanced artificial intelligence that won’t put up with your crap! Outsmart these virtual humans and feel superior to your computer!